Oil prices fell in the wake of last week's death of Col. Moammar Gadhafi. But it was a small dip, and it didn't last for long. Still, while the Libyan dictator's death may not lead to lower gas prices for U.S. drivers in the short term, down the road improved world crude supplies should stabilize prices. That in turn would lead to fewer surprises at the gas pump. Though Libya only produces about 2% of the world's oil, even small disruptions in crude supplies can have a big effect on production and prices. Before civil war broke out, Libya had been producing about 1.5 million barrels of oil per day. As output dried up, European refiners, which buy about 85% of Libya's output, were hurt badly and prices for Brent crude soared to as high as $127 a barrel in April. Even though only about 3% of Libyan oil winds up in the U.S., gasoline prices in the U.S. surged on concerns about Libya. Gas prices now average $3.47 a gallon, up from $2.83 a year ago, according to the AAA Daily Fuel Gauge Report. Many experts believe that it will be months before the Libyan oil sector is running at full capacity again. As the Associated Press notes, analysts expect Libya to produce 600,000 barrels per day by the end of the year and 1.6 million a day by the second half of next year. If that prediction proves accurate, oil could drop by between $10 and $25 a barrel. However, prices may rise further amid concerns about other issues, such as rising demand from the developing world. Libya's Opportunity ... Or Its Demise? 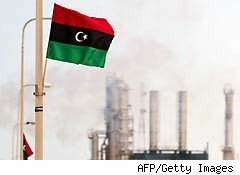 According to the U.S. Energy Information Administration, many experts believe that Libya's oil reserves, reported to be Africa's largest, have been underexploited, even though many foreign companies tried to do business with the Gadhafi regime when relations warmed between Washington and Tripoli after sanctions were lifted during the Bush administration. With billions to be made, many companies will be willing to take the risk. But the results might be mixed. ExxonMobil (XOM) returned to Libya in 2005 after a nearly 25-year absence. Later, it said a well that it drilled off the Libyan coast was not commercially viable. The enthusiasm of other oil companies also waned. Chevron (CVX) and Occidental Petroleum (OXY), which also came back, decided in 2010 not to renew their five-year license to explore for oil and gas. Though it was not mentioned at the time, many oil companies were worried that Gadhafi would nationalize their assets. To further complicate matters, many foreign oil workers fled Libya in recent months as the fighting intensified. Still, Libyan's light, sweet crude is especially attractive to refiners because it is easier for them to convert it into gasoline and diesel. Getting to it is just a little bit easier now that Gadhafi is gone. Motley Fool contributing writer Jonathan Berr owns none of the companies mentioned in this article. Motley Fool newsletter services have recommended buying shares of Chevron.